There’s really no better all-round fitness activity than swimming. But 50m back and forth, back and forth in a pool staring at a black line isn’t exactly for everyone. 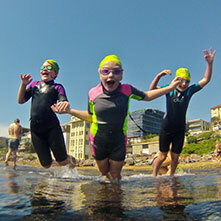 This introductory-level, 3-hour Learn to ocean swim clinic will familiarise you with the basics of this increasingly popular summer activity with an abundance of ocean swimming tips & techniques to start you on your ocean swimming journey. Enter number of participants, then complete the participant form/s and Complete Registration to make payment. Breezy in the morning and mostly cloudy starting in the evening.